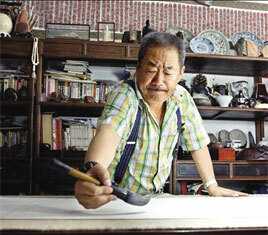 Du Benji is the second-generation apprentice of Xu Beihong, Chinese master of modern fine arts. During Du's 50 or more years of accumulation and experience in artistic circles he has created a type of calligraphy that is executed in a manner entirely at odds with the normal approach. Contemporary calligraphers call it "mighty script," an epithet that conveys its distinctly peremptory air. The style Du has created bears no resemblance to the Han Dynasty (206 BC-AD 220) seal character official script, running script or regular script. It has consequently opened up a new area of debate among calligraphers. At the beginning of the new millennium, Du was assigned eight calligraphic works that began with the Chinese character tian (heaven). They included the CCTV serialized drama, Granary under Heaven; a special soccer tournament marking the 10th anniversary of the return of Hong Kong to the motherland named Olympics under Heaven; and a piece entitled Harmony under Heaven exalting the country's harmonious and prosperous society. Heaven being the key concept in Du's calligraphic works, his fellows have dubbed them "mighty script under heaven." A full 20 years ago, a scholar wrote to the Yangcheng Evening News after seeing Du's calligraphy, pointing out its domineering conceit. Du's calligraphy on a 67-m length of silk recording China's campaign against SARS (severe acute respiratory syndrome) became part of the Capital Museum collection in 2003. Another 64-m-long scroll of his calligraphy was accessioned into the National Museum of China collection in 2004. "Give me a reason, a way of thinking and a space, and I will endeavor to break through restrictions imposed by predecessors," says Du, who has set up the Du Benji Calligraphy and Painting Studio at Jiguge, Liulichang in Beijing. "Calligraphers and painters need to innovate according to the times," Du asserts.